First I’d like to say a huge “thank you” for hosting me and helping me showcase my work. I really appreciate it. I enjoyed answering the questions and I hope everyone enjoys reading them. And that they enjoy my books too, of course! • Please tell me about yourself. 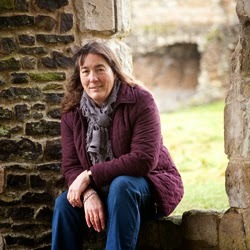 I’m Cas Peace, a fantasy and non-fiction author from the UK. I live in Hampshire, in the south of England. I’ve been married to my lovely husband Dave for 24 years, and we live in a 1900s cottage in a delightful, small village. We have two rescue dogs, Milly and Milo. I love singing, and as well as writing and recording the folk-style songs and music for my books, I also sing in our local church choir. My hobbies include playing the bodhran (Irish drum), gardening, and caring for my large collection of cacti. I also used to work in stained glass, but don’t get the time for that now. • What is something about you that no one knows? This is a bit embarrassing really, but I must have been a bit of a whiney child because my father’s nickname for me was “Grizelda Pugh”. I hated it! • What is your workspace and writing routine like? Share a pic of your workspace if you like. I have two workspaces, depending on the time of year. When the weather’s good, I love to work outdoors. I take a small table outside and sit so I can overlook my garden. Because we’re in a small village, and we live down a single-track, dead-end lane, it’s often really quiet apart from birdsong. In the colder weather I work in my study, which also doubles as a music room. As for my routine, I rise around 7.15 a.m., have breakfast, and then walk the dogs for an hour. After that I answer emails, and then get down to work – either writing or editing (I’m a freelance editor and proofreader). Lunch is usually at 12.15 p.m. for an hour, and then I work on until 3 p.m. when the dogs get their second walk. I finish work around 5, or 5.30 p.m., and then either relax, practice some music, or do whatever Dave and I have planned for the evening. At the moments I’m reading “I, the Sun” by Janet E. Morris. Janet is a best-selling, highly-acclaimed US fantasy, sci-fi and non-fiction author, and I particularly love her Sacred Band of Stepsons novels. I was fortunate enough to be introduced to her a while back and was thrilled when she read and thoroughly enjoyed my own novels. She likes them so much that she has endorsed them. I can’t tell you how much that means to me! • Some favorite books and authors? I particularly love Anne McCaffrey’s Pern series; I avidly read Stephen Donaldson’s Chronicles of Thomas Covenant; I loved C J Cherryh’s Chronicles of Morgaine (the heroine of my own novels owes much to Morgaine); I really enjoy Terry Pratchett’s Discworld novels; the Lord of the Rings is a favorite, as is author Barbara Hambly. There are many more! • Animals are a huge part of your life. Are they good company when writing as well? They certainly are! I often get lost in my writing when I’m actively working on a book and I have sometimes been known to forget to eat. Milly and Milo aren’t too keen on foregoing their dinner, or their walks, so I can rely on them to let me know what the time is. I’m always amazed at how accurate they are regarding dinnertime, or walkies time. They are often within a minute of the time I usually take them. Also, if I get a bit stuck on something, or if my writing doesn’t feel like it’s flowing right, I will stop and play with the dogs. They are great at knowing if I need distracting, and walking them can both soothe me if I’m feeling frustrated, or help kickstart the ceative juices once more. I wouldn’t be without my precious dogs. I’d love to own a horse again, too (it would have to be a Friesian, like Sullyan’s Drum) but it’s one of the most annoying paradoxes of my life so far that although I could now afford to buy and keep the kind of horse I’ve always wanted, I have neither the time to dedicate to one nor the physical strength to look after it properly. I guess nothing’s perfect! • Do you prefer human or animal company? Depends on the human! I’d prefer to share the company of those humans I love the best with the animals that are dearest to my heart. But if we’re talking in general terms, and en masse, then I’d have to choose animals. Humans have grown too arrogant, too grasping, too uncaring of others or the world about them for their own good. Animals only take what they need to survive – they rarely massacre their own kind or seek to destroy their environment. We, as humans, need to remember where we came from, and realize that this earth, this Universe, wasn’t put here simply for us to rip apart as we please. 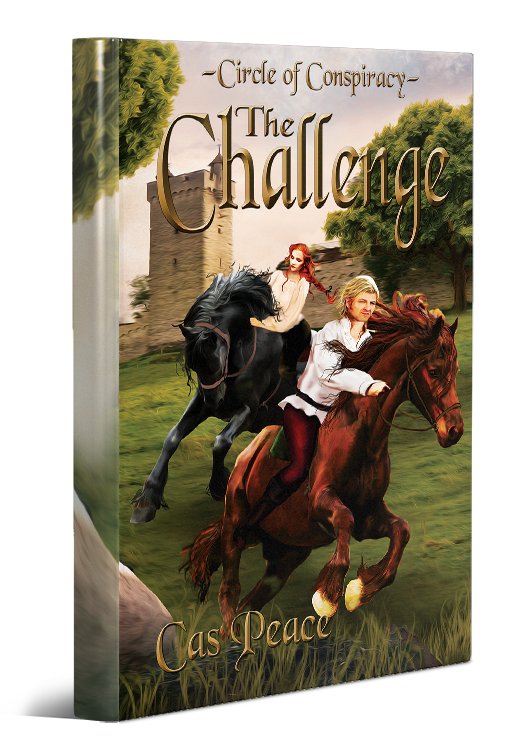 • Please share about your latest book, The Challenge. Now there’s a fourth book on Albia’s horizon: The Challenge, also Book One in Peace’s forthcoming sub-series, the Circle of Conspiracy trilogy, proof of more Albian tales on the way. So start reading now. I, for one, can’t wait to find out what will happen next. -Janet Morris: The Sacred Band of Stepsons; the Dream Dancer series; I, the Sun; Outpassage.